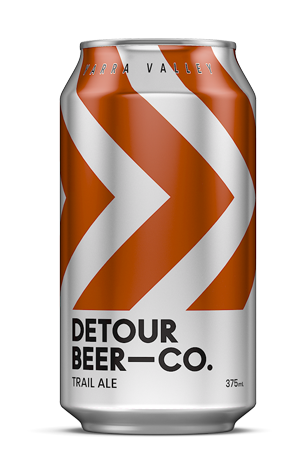 One of two beers in the Detour opening foursome to come with a name rather than bearing its style on its sleeve is the Trail Ale. It's a nod to what the Yarra Valley offers visitors but also the nature of the beer: it's the brewery's mid-strength, thus suited to refreshment when you're out and about. As with a growing number of beers weighing in around 3.5 percent ABV, it still delivers plenty, with Melba and Astra hops from Victorian hop growers Ellerslie Hop firing off ripe melon aromas and backing those up with pleasant citrus flavours. There's a little cracker like malt sweetness and a touch of drying bitterness completing the picture in a beer that should make the designated driver in your group's lot a happier one than it might have been.